The proposed plan includes permanent space for the Troy Waterfront Farmers' Market. The city of Troy formally announced today that it's picked a proposal for the redevelopment of the former city hall site on Monument Square downtown. 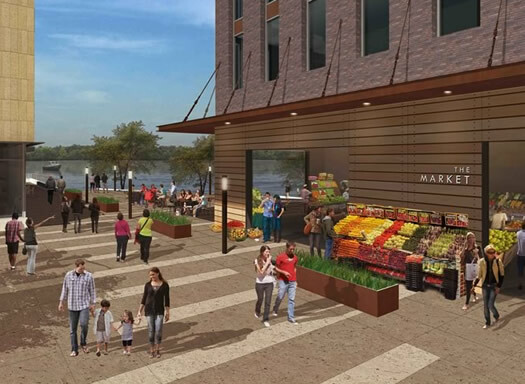 And the proposed $27 million project includes a lot of potentially interesting bits: residential, retail, commercial space -- and maybe most interesting of all, a permanent home for the Troy Waterfront Farmers' Market. 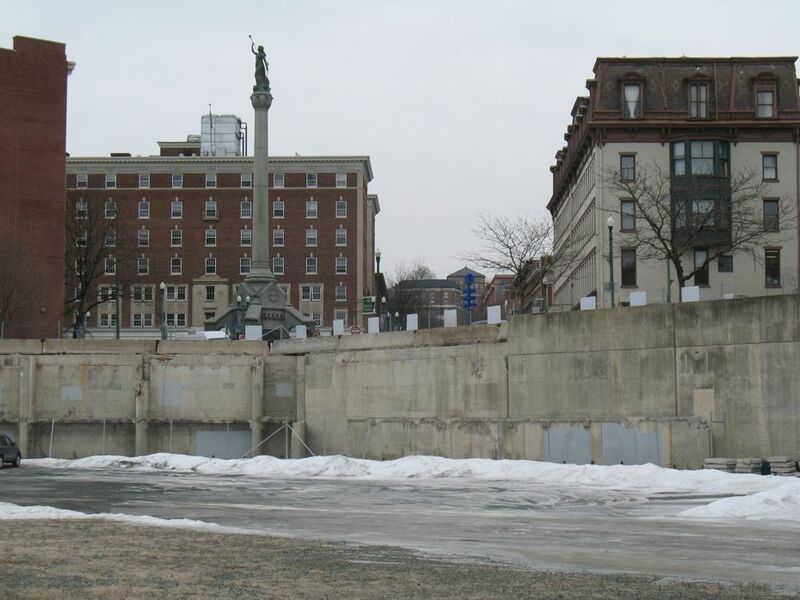 The site is a prime spot, located between the Hudson River and Monument Square right in the heart of downtown Troy. It had been the site of the former city hall until the angular, concrete building was demolished in 2011. The site has been vacant ever since. 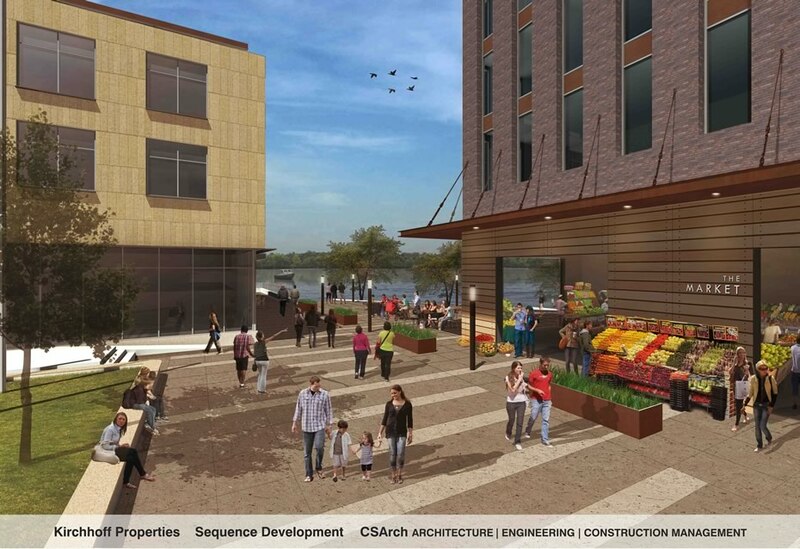 + Two mixed-use buildings separated by a plaza providing access to the river from River Street. + Fifty or more "luxury" apartments. 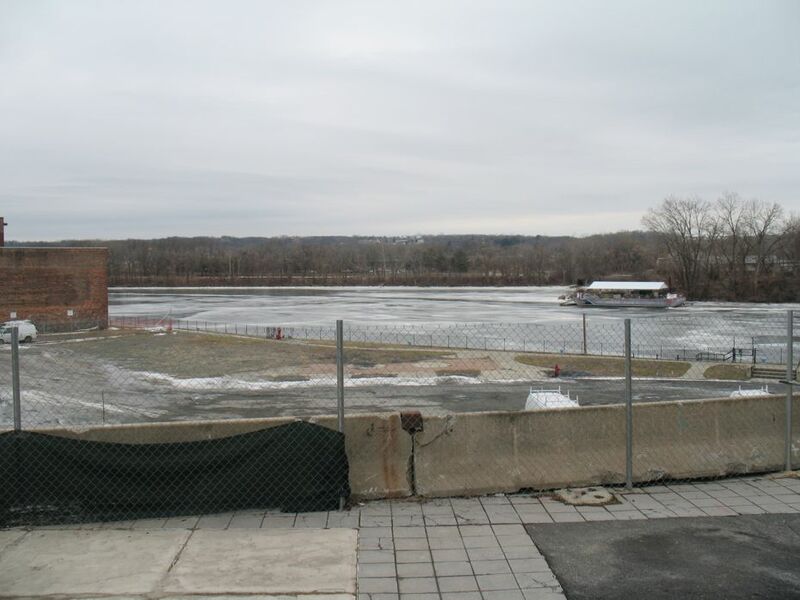 + A permanent indoor/outdoor space for the Troy Waterfront Farmers' Market (20,000 square feet). + The possibility of incorporating a new city hall space into the development. + A 175-space parking garage. The proposal for the project is from a group headed up by the Kirchoff Companies, a development company that works throughout the Northeast and reports $700 million a year in project volume (its construction arm recently built the new UAlbany business school building). As involved: Sequence Development, which includes former city official Jeff Buell, the CSArch architecture firm, the LA Group, Ryan-Biggs, and Gramercy Communications (the firm owns is an adjacent building). The project is estimated to cost $27 million. Troy mayor Lou Rosamilia says the city has about $4 million in state and federal grants it will put toward the project. And he said the Kirchoff group's proposal submitted to the city include a bank letter indicating that financing was lined up for the project. And, of course, there's always the question of some sort of tax break/payment in lieu of taxes arrangement. And Rosamilia said today that a PILOT is a possibility. There are renderings above in large-format (click or scroll all the way up) -- they're the quickest and best way to get a feel for the design. But Expanding on the design a bit: the project calls for two buildings -- Monument North and Monument South. The building would be separated by a plaza that lines up with Broadway. The plaza area would expand along the river side of the buildings, with a sort of ramp/terrace leading down to the water. The farmers' market space would be located on the plaza level of the Monument North, as would the parking garage. City hall, if returned to the site, would be located in Monument South, opposite the market. Tina Mesiti-Ceas, from CSArch, called the site a once-in-a-lifetime opportunity because of its location between the square and the river. She said designers aimed to preserve the sense of place along River Street along with the views of the river, aiming to be "respectful of both scale and context of surrounding buildings, and fit alongside rather than overpower the historic architecture on River Street." 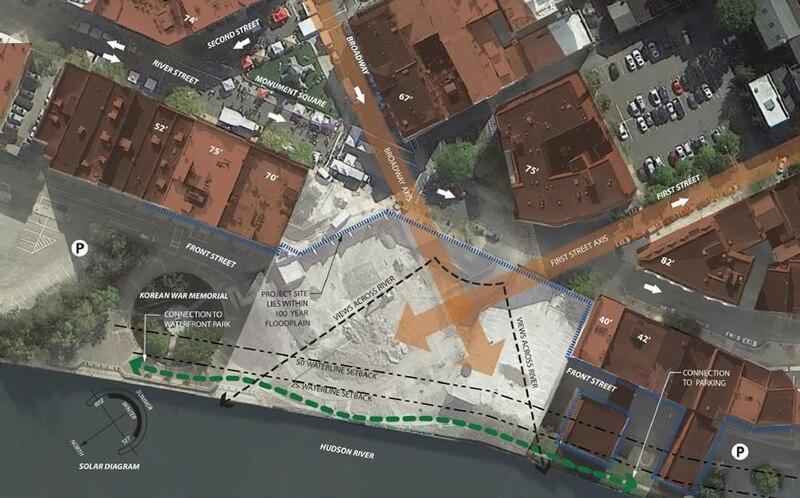 The most interesting aspect of this project -- for people both in Troy and elsewhere -- could be the proposed permanent space for the Troy Waterfront Farmers' Market. Jeff Buell, from Sequence Development, said the market provided an "anchor" for the development, and offered the opportunity to differentiate it. "When we were looking at what should this site be, in my head, we always go back to two things in 2014, and in the coming years, we're going to need to be able provide a couple of things to people and those are products and experiences that you can't have on the internet," said Buell, calling the market both an experience and business rolled into one. "It can be something very, very special. ... We have very high hopes that we we're going to advance that farmers' market into something new and unique." The 20,000 square feet of space would open onto the plaza area, allowing the market to operate year round from the same space. And the current plan also calls for the market to have at least partial ownership of that space. "So that's going to give us a lot of possibilities for markets at other times of the week, our vendors can open stores throughout the week," explained Seth Jacobs, president of the farmers' market board (and Slack Hollow Farm). "We could have a cooperatively owned store run by the vendors. This is going to be a very beautiful site, indoor/outdoor, heated when it's cold. So there's possibility for a lot of other sorts of events." The market currently operates on River Street (usually) during the summer, which is a nice setting -- as long as the weather cooperates. But when it doesn't, the vendors can take a big hit. "My sales at the Troy market operate under a business model where if it rains, they are cut in half," said Jacobs today. "That's not a very good business model. So as a vendor, I'm really looking forward to having a brick house, if you catch my drift." For the farmers' market to build out the space, it will need to raise funding. Jacobs said they're "angling for several million dollars of grant money" from the state and federal governments. While the developers view the farmers' market as an anchor, the siting of a new city hall seems much more up in the air. Rosamilia said the matter required further discussion, and said he'd be forming a committee to examine it. Troy's city hall is currently operating out of office space in the Hedley Building on River Street, north of the Green Island Bridge. Rosamilia said the city has the option of exiting its lease every two years. If the city hall doesn't go into the Monument South building, Rosamilia said the space could be use for more retail and/or residential. Haven't we been through all this before? The state of the site today. Yep. This is the third go around for the city in trying to get the site redeveloped. This latest go around is attempt #3. The Kirchoff proposal was picked from a pool that also included a proposal from a team composed of Bonacio Construction and RPI. So why should there be confidence something's actually going to happen this time? This morning Rosamilia cited Kirchoff's size and track record: "They've done major, major projects. We're very confident that this company can pull off everything we've talked about and every design we've spoken about." And Rosamilia said the city had also received assurance, in the form of a bank letter, that Kirchoff has financing lined up. Downtown Troy has been riding a wave of momentum over the last few years, with new investment -- notably residential projects. And in a way, Troy represents the hope of a lot of cities in this area, that maybe there is a vibrant future for them as the trends swing back toward walkable, urban areas. As state Senator Neil Breslin said today as part of an anecdote about how he explained to his staff why he was always ending up in Troy: "The things that are important to the Capital District are happening in Troy, New York." So the hope is that this Monument Square redevelopment project will push Troy to a different a level. Or as Breslin said, "This is the linchpin, this will bring it together. This will give Troy almost steroids for success." The initial timeline for the project includes completion of Monument North by fall 2015, with a groundbreaking sometime this year. Work on Monument South would start after that. Before ground is broken, the plan will need to be finalized, and get the OK from the city planning board, and the city council will have to approve the sale of the site. Rosamilia cautioned that the city wants to make sure everything is lined up correctly before work starts. "We haven't rushed to this point, and we're not going to rush it now." Dear Albany, Perhaps we could learn something from this. Currently all the potential convention center customers would have to advertise to attendees are a handful of of restaurants. We need some infrastructure to compete with other cities. Has anyone on the convention center board even been to a convention in convention meccas like San Antonio, Orlando, Chicago, Philadelphia and the like? I know were not the same size but if you don't provide at least some of it, what's the value add? We're the capital of New York State! >> The possibility of incorporating a new city hall space into the development. Considering the former City Hall was the entire use of this space previously, I'd say this point is a fairly important one. Why are they so far along in the planning of this project if that question is yet unanswered? I'm excited for this project again! The plan has some of my favorite features from the Nigro/Richman plan - specifically the two buildings separated by an open plaza extension of Broadway. did anyone make sure there isnt some 400 year old washed out fort of treasure and relics there? Hopeful, but . . . $27 million seems pretty low for that much structure. I hope the City gets an independent cost estimate to determine whether it's really buildable for the assumptions being used. I like the idea of what they are developing, but the architecture looks fairly modern and out of place with the surrounding buildings. Have we forgotten what an eye sore the old city hall was? CS Arch put a lot of white people in their drawings. I guess that's who they imagine will be in the "luxury" apartments, which appears to be a kind of Hudson Valley Community College parking garage Sur La Seine. Does CS Arch not have the capability of sketching in realistic chain-link fencing? Because that's the first thing Troy will put up around that river bank. I agree with Spencer. I don't think that the architecture blends well with the existing city. Kind of a disappointment, because the concept is very neat. I agree with others about the architecture. I live on this street and I love the way our neighborhood looks, except for the giant hole where the new project will be. I wish they'd incorporate the same style of buildings we have now. It'll flow better. Buildings are very ugly and do not fit in with surrounding architecture! How do they plan on handling parking for the farmers market? Shame they can't move the market inside the atrium when it rains in the summer. To quote an older commercial, I'm skeptable. Mike: even if none of the parking built into this project is available for the farmers' market, there's still free weekend parking at the Uncle Sam garage at Fulton/River, less than 200 yards away. For the love of pete can we stop all the whining and wishing that all buildings looked the same? Would you like the old architecture so much if they had said, know what, we shouldn't design anything new, let's just stay with mud huts because that's what was here before? Stop it. Let each age express itself. There are ugly historic buildings as well, take off the rose colored glasses. Besides, there is literally no feasible way to match the quality and detail of ornamentation of old buildings. The knowledge and talent almost do not exist any more, and if you could find craftsmen to do it, it would be so cost prohibitive as to be impossible. These proposed buildings respect the proportions, massing, and sight lines of the site and buildings around them, while using a newer language. The addition of a permanent home for the Farmer's Market is a great way of addressing community use and needs. And I say this as an architect that regularly works on historic renovation and restoration, as well as new modern construction - let each be their own thing, please! Amen times two, Beth! People around here seem to think that the only way to complement historic architecture is to build fake-historic architecture. That's exactly wrong. It shows disrespect toward both the past and the present. I would like to know what's James Kunstler take on this new project. Has anyone approached him for advice? I'm with Beth. It's not like they razed an historic building to put up something modern and refreshing. And for all the skeptics, what's wrong with having a little hope in something for once? Jim Kunstler has been commenting on this project on several public threads on my facebook page (other comments by Don Rittner, a member of the planning board, a city official, members of the Congress for the New Urbanism, and many community members). It'll be interesting to see these ideas and renderings come to life. How am I only the second person to call out the fact that all these people seem to be white...hmm. While I agree with Spencer and Leigh that the design doesn't match the surrounding buildings, I'm not sure that we should value homogeneity as the most important factor. Design sensibilities are always evolving, and if we get locked into a particular style that was popular when this part of the city was originally developed, what I fear we'll end up with is a theme-park imitation of something from another era. To be honest, the design isn't to my taste, and I would prefer that it at least incorporates or references elements of the surrounding architecture. But I also feel strongly that even this bland design is better than the gaping pit we have had for the past couple of years - and considering that we've been through two failed attempts already, perhaps we should appreciate the beauty of the building that can get built rather than lamenting the loss of the hypothetical beauty of what could never be. Kudos to AOA for featuring this project. That the development and design team released drawings of the project so early on, and so opening themselves up for criticism, is a very good thing. How many other projects do we know about, how many are open to the public so early? I would've loved to see a plan to get a better idea of how the buildings really interface with the public street to the east. 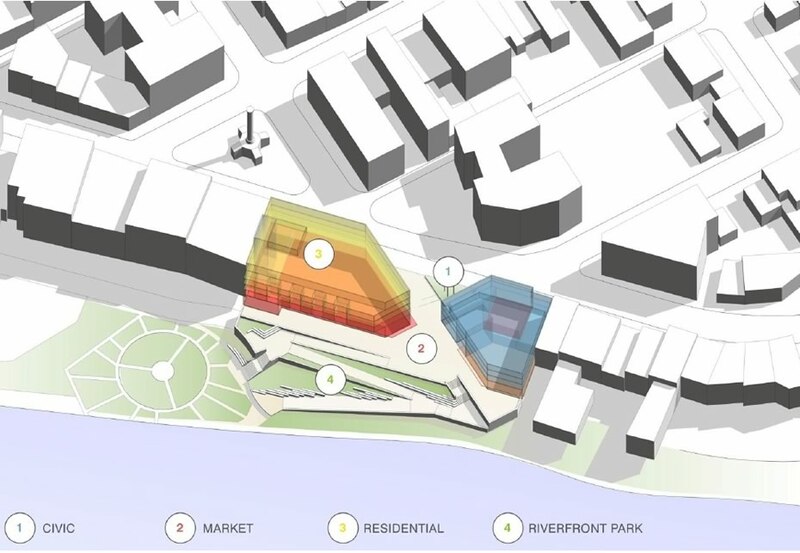 From the massing diagram (http://alloveralbany.com/images/monument_square_2014_Massing_Diagram.jpg), the riverfront park designed by The LA Group has a good mix of sitting, standing, lounging, soft and hard surfaces. One challenge of the riverfront plan (that could be problematic in future waterfront work) are the large "retaining" walls to the north and south. 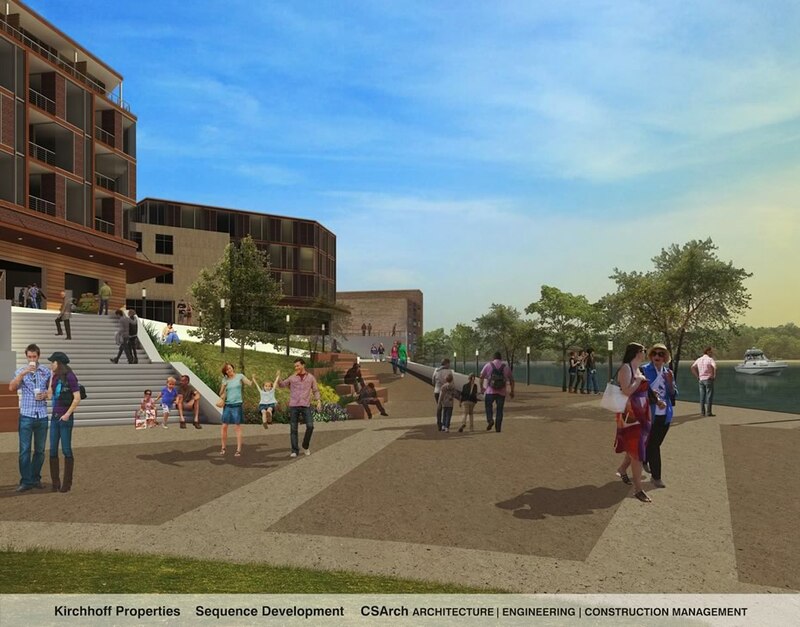 Those walls (and other walls along the walking ramps) have to be seriously considered by the team and the City of Troy to ensure that projected future pedestrian flow through the site would not be hindered or too forced. That said, design is an iterative process, and it's very likely a lot of these details will change as the design develops. I would love to see more. I'm hoping these conceptual renderings are just the starting point in the evolution of the design for Monument Square. I am new to Troy and I have spent a good share of my five months here marveling at Troy's architecture. That said, I agree with Beth that we can't expect the detail and ornamentation of Troy buildings of the late 1800s to be duplicated, for the reasons she states. That's not to say that I like the building design of current concept, at least as far as I understand it. It would be great if, instead of recreating the past, these buildings could express an exciting architectural future for Troy. Part of that should include a hefty dose of green/sustainable design. Look at projects like Via Verde in the Bronx, or other recent SmartGrowth winners: http://blog.epa.gov/greeningtheapple/2014/02/the-bronxs-via-verde-wins-a-well-deserved-smart-growth-achievement-award/. I'm hoping future versions of this design will give us insight into the functioning of the building (in terms of sustainable design) as well as its form. There is such a thing as bad architecture. Modern architecture may be interesting to look at, but it does not hold any objective beauty. There are classic and timeless design concepts such as the rule of three, balanced and proportional spaces, and the 5 classic orders. When these theories are applied, they create buildings whose designs naturally resonate with our being. Additionally, I doubt that, by the time all the red tape is cleared, the radical design proposed in the graphics above will remain; it will most likely be toned down. Even City Station looked rather modern in the initial proposals. 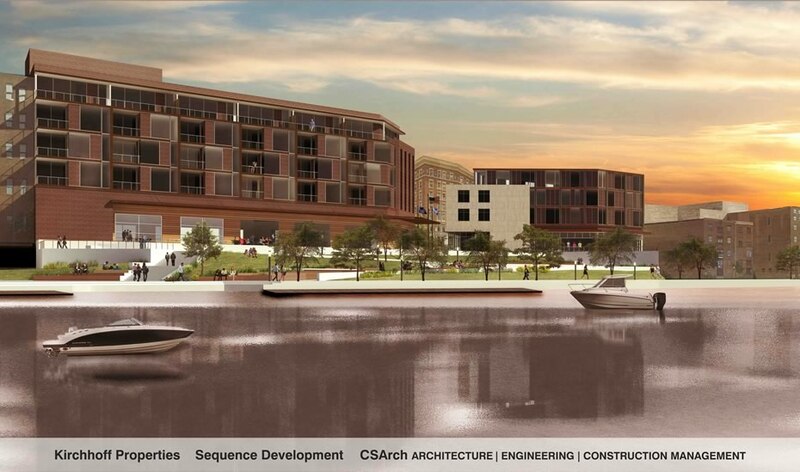 Everyone should also note that these are renderings of a project in its early phases, submitted for the RFP. Now that it has been accepted, a lot of design development will occur as budgets and project scopes are further refined. And Andrew, while there are design concepts found in nature like the Golden Proportion and Fibonacci Sequence, etc, they are not markers of good architecture. And "Beauty" is certainly subjective! Much of modern architecture serves to express the functions held within, like the Folk Art Museum in NYC or to showcase new technologies like the Crystal Palace and Eiffel Tower did. Proportion can be purposefully played with to engage with the audience like Ronchamp. Or a building can hope to express a public feeling, like the Freedom Tower at Ground Zero. Good architecture should be interesting, engaging, thought provoking, sustainable, and serve the greater good of the community. It has nothing to do with the classical orders.